On the 7th (Mon), admire the landmark architecture of Chhatrapati Shivaji Terminus, then cruise along Marine Drive, and then let your taste buds guide you at a local gastronomic tour. Plan a trip to Mumbai easily and quickly by telling Inspirock to suggest an itinerary. If you are flying in from India, the closest major airport is Chhatrapati Shivaji International Airport. In January, plan for daily highs up to 36°C, and evening lows to 19°C. Finish your sightseeing early on the 7th (Mon) so you can travel to Bangkok. 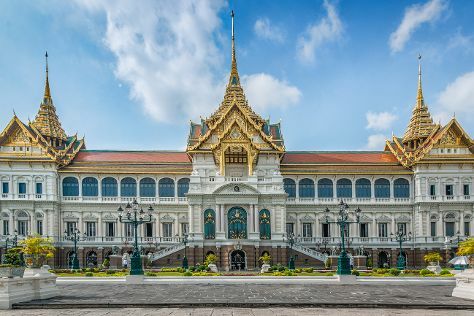 Start off your visit on the 8th (Tue): explore the historical opulence of The Grand Palace, then take in the spiritual surroundings of Wat Pho, then take in the spiritual surroundings of Temple of Dawn (Wat Arun), and finally contemplate in the serene atmosphere at Wat Saket. Here are some ideas for day two: take in the spiritual surroundings of Temple of the Emerald Buddha (Wat Phra Kaew), then take in the spiritual surroundings of Temple of the Golden Buddha (Wat Traimit), then admire the landmark architecture of Jim Thompson House, and finally get outside with SEA LIFE Bangkok Ocean World. For more things to do, reviews, ratings, and tourist information, you can read our Bangkok vacation planning website . Traveling by flight from Mumbai to Bangkok takes 7.5 hours. Alternatively, you can do a combination of flight and bus; or drive. Traveling from Mumbai to Bangkok, you'll lose 1 hour due to the time zone difference. Traveling from Mumbai in January, you can expect nighttime temperatures to be a bit warmer in Bangkok, with lows of 26°C. Wrap up your sightseeing on the 9th (Wed) to allow time to travel to Karon. Kick off your visit on the 10th (Thu): see some colorful creatures with a scuba or snorkeling tour, make a trip to Bangla Road, and then enjoy the sand and surf at Patong Beach. Here are some ideas for day two: contemplate in the serene atmosphere at Chaithararam Temple (Wat Chalong), then stroll through Kata Beach, and then kick back and relax at Karon Beach. To see traveler tips, photos, reviews, and more tourist information, read Karon sightseeing planner. Getting from Bangkok to Karon by combination of flight and taxi takes about 3.5 hours. Other options: drive; or do a combination of train, bus, and taxi. Expect a daytime high around 37°C in January, and nighttime lows around 26°C. Finish up your sightseeing early on the 11th (Fri) so you can travel to Ko Lanta. 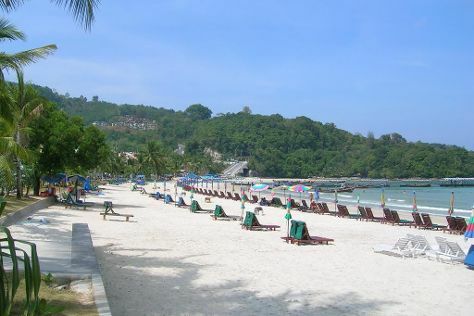 Ko Lanta remains an ideal place for relaxing holidays off the west coast of mainland Thailand. Start off your visit on the 12th (Sat): discover the deep blue sea with a scuba or snorkeling tour. Get ready for a full day of sightseeing on the 13th (Sun): stop by Fashion Point, kick back and relax at Long Beach, then identify plant and animal life at Lanta Animal Welfare, and finally kick back and relax at Lanta Klong Nin Beach. To see photos, more things to do, reviews, and other tourist information, read our Ko Lanta day trip planning site . Do a combination of car and ferry from Karon to Ko Lanta in 3 hours. In January, daytime highs in Ko Lanta are 38°C, while nighttime lows are 26°C. Finish your sightseeing early on the 13th (Sun) to allow enough time to ride a ferry to Ko Phi Phi Don. Start off your visit on the 14th (Mon): enjoy the sand and surf at Laem Tong Bay, cool off at Aquaride, and then get a new perspective on things with Boat Tours & Water Sports. To see maps, photos, and tourist information, read Ko Phi Phi Don day trip tool . You can ride a ferry from Ko Lanta to Ko Phi Phi Don in an hour. 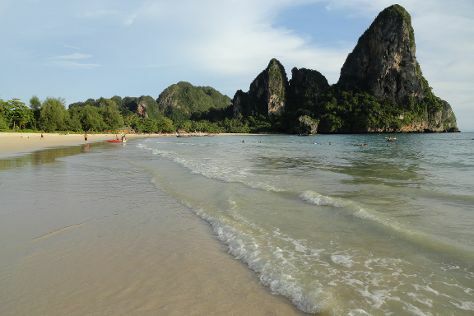 In January, daytime highs in Ko Phi Phi Don are 37°C, while nighttime lows are 26°C. Cap off your sightseeing on the 14th (Mon) early enough to catch the ferry to Krabi Town. Start off your visit on the 15th (Tue): tour the pleasant surroundings at PhraNang Cave Beach, then stop by VICTORIA Fashion House, and then tour the pleasant surroundings at Ao Nang Beach. To find more things to do, other places to visit, ratings, and tourist information, use the Krabi Town trip itinerary maker website . Traveling by ferry from Ko Phi Phi Don to Krabi Town takes 1.5 hours. Alternatively, you can do a combination of ferry and bus. In January, plan for daily highs up to 37°C, and evening lows to 26°C. Wrap up your sightseeing by early afternoon on the 16th (Wed) to allow enough time to travel back home.